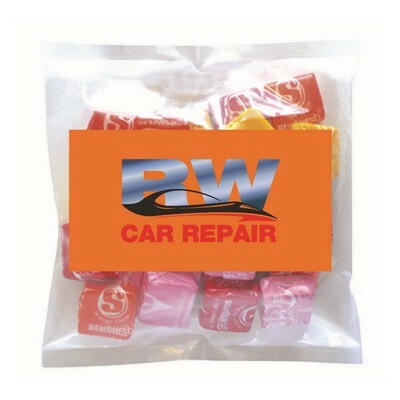 Immerse your clients in the wonderful world of tasty candies by giving them the Small Bag of Starbursts. It comes with a business card magnet to imprint your brand’s logo and other information, which ensures that the clients remember your brand as the best. Their tantalizing flavors are sure to set them apart from other promotional treats, making your brand inviting and memorable. These candies come individually wrapped in attractive colors. They make lovely party favors for weddings, banquets, parades, trade shows, and trick-or-treating, and are sure to boost your brand’s image and value.